Who will walk out victorious from the event? While WrestleMania 35 is on the horizon, many of us are equally excited for the NXT TakeOver: New York event. The reason for that is the top class matches NXT has been repeatedly dishing out thanks to their superior class of performers, and the way storylines have been built in very little time. Many NXT stars have been performing extremely well on the main roster too, and that is sure to increase the fans’ attention towards NXT events. A total of five championships from the brand will be defended at the event which will make the event as high profile as it ever has been. It will also crown a new NXT Champion at the end of the night as Tommaso Ciampa had to relinquish his title due to a much-needed surgery. Keeping all that in mind, here are some early predictions for the event which will be held on April 5, 2019, in New York and feature matches from NXT and NXT UK. Take a look at 5 predictions for the event, and share your thoughts on the matches in the comments below. 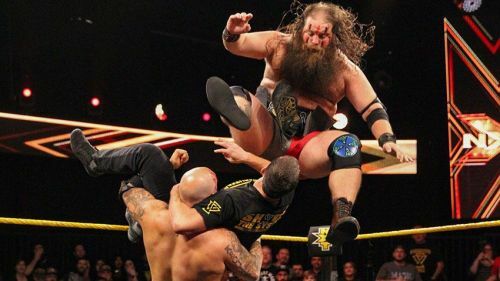 While Aleister Black and Ricochet have been making waves on the main roster, going as far as receiving Tag Team Championship matches from Raw, they are still in contention for the NXT Tag Team Championship. War Raiders have been extremely dominant on NXT, and they have been having a good time since beating The Undisputed Era for the titles. War Raiders haven’t held the championships for two months, and it seems unlikely that they will be losing the titles so early without featuring in a few high-profile matches. Aleister Black and Ricochet, on the other hand, are having a great time on the main roster and it seems as though they will make a full transition to either Raw or SmackDown soon. Therefore, it seems like they won the tournament just because of the injury to Tommaso Ciampa and are in the match to keep things rolling. Considering the current circumstances, War Raiders seem to be the favorites in the match and could well retain their titles at TakeOver.